A good friend of my Steve Young works for a video game company called Net Devil. He gave me one of the coolest christmas presents ever. 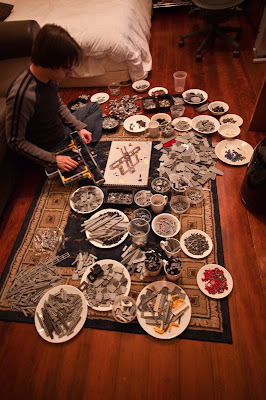 A Starwars collectors edition LEGO Millennium Falcon. Net Devil is working on the latest MMORPG (Massively Multiplayer Online Role Playing Game) for LEGO in the lego universe. Pretty sweet. 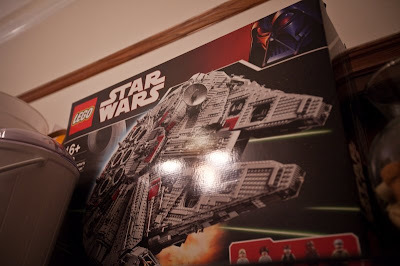 It has well over 5000 pieces and I anticipate it taking upwards of 30+ hours to build. If I was twelve again, my head might explode. I spent over three hours just organizing the pieces, and it still feels like a disaster. Pretty awesome. More progress as I get there...Great to feel like a kid again. This feels pretty therapeutic. Also- "Better" photos later. I got really lazy...felt more like building! All I can say is, "good grief, I'm glad you didn't get that when you were twelve!!" You would have done nothing else and your fingers would have needed bandaids! Seems like you have some help there too!! Good Luck!!! Hey you certainly have spent many a hour playing with legos when we were younger. LEGOS!!! I think you may need to play with duplos though. Are you good enough to play with legos? Seeing all the legos makes me want to dig mine out of the garage. Then again, there are black widows as big as your lego ship. Maybe I'll just leave them there until Tim comes out to visit. Thanks so much for showing me how to bottle beer. It was a first and s highlight of my week. :-) I really enjoyed learning, especially the capping. Thanks for making time to hang out. Don't be a stranger when you are out in the Sacramento area. Enjoy the last remaining bits of spring break.